The University of South Carolina Gamecocks football team made all of us alumni extremely proud with an exciting 33-28 victory over the Michigan Wolverines in yesterday's Outback Bowl. The Gamecocks finished the season with an 11-2 record, making it back-to-back 11-win seasons for the first time in school history (last season was the first time the football program had ever won 11 games in a season). To understand how happy I am, let me put it into perspective. The Gamecocks have wrapped up two consecutive 11-2 seasons. When I was a student at South Carolina, my freshman year in 1998, the football team had a 1-10 record (under head coach Brad Scott), and in 1999 we finished 0-11 (under head coach Lou Holtz). The records have almost completely reversed! 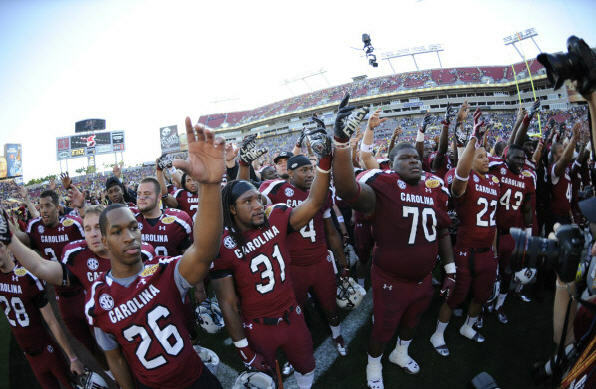 The Gamecocks celebrate their 2013 Outback Bowl victory Tuesday. Holtz, who inherited a struggling team, would go on to give us exciting seasons during my last two years at school, finishing 8-4 and 9-3 during the 2000 and 2001 seasons (he also delivered the commencement speech at my graduation in spring 2002). But he was never able to build a dominant football program. Then came along the hiring of Steve Spurrier to replace Holtz in 2005. Spurrier has produced winning records (and one .500 season in 2007) during each of his eight seasons at South Carolina. The first few years were above average, usually equaling about seven victories a season. But over the last three seasons, Spurrier has built a powerhouse football program: 9 wins in 2010, including an SEC Eastern Division Championship, and, as I previously stated, 11 wins each in 2011 and 2012. Spurrier has created this success by making the University of South Carolina a place where many of the top high school football players in the country want to go. And he's especially succeeded in attracting the top in-state talent. When I was growing up in South Carolina, most of the top football players from the state would choose the other Southern schools like Florida, Florida State, Tennessee, LSU, Georgia, and Auburn. And if they stayed in state, they were most likely to choose Clemson. But not anymore. Spurrier, for example, has recruited four out of the last five South Carolina Mr. Football Award winners, an honor given to the top high school football player in the state (announced each December at the conclusion of the high school season). Four in a row became Gamecocks—2008 Mr. Football Award winner, cornerback Stephon Gilmore; 2009 winner, running back Marcus Lattimore; 2010 winner, defensive end Jadeveon Clowney; and 2011 winner, wide receiver Shaq Roland—until the 2012 winner, wide receiver/running back Tramel Terry signed with Georgia last month (there's still time for him to come to his senses though). Gilmore, Lattimore, and Clowney each have become/became among the top players in college football in their positions. And it's with Clowney that I will end this boasting. The Rock Hill native, whose signing less than two years ago was the highlight of my Valentine's Day wish, will go into the 2013 season as the best defensive player in college football and will be a Heisman Trophy favorite. He solidified that with his tenacious play throughout the 2012 season, and he summed it up in a single play in the Outback Bowl yesterday. In the fourth quarter, with South Carolina trailing Michigan by one point, and after a controversial first down call by the officials that went in favor of the Wolverines, Clowney took matters into his own hands, literally, with a ferocious, break-neck speed, helmet-flying-off tackle on running back Vincent Smith that caused a fumble that he also picked up with one hand. The play quickly became an Internet sensation, with SB Nation posting a gif of the sequence within minutes of it happening. You can watch video of Clowney's unbelievable play.